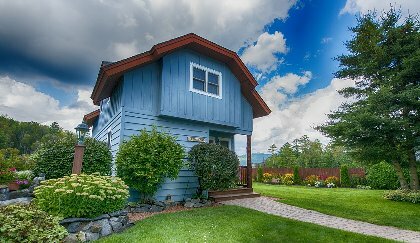 Our picturesque Inn has lodging directly on Lake Placid with magnificent views of Whitieface Mountain. 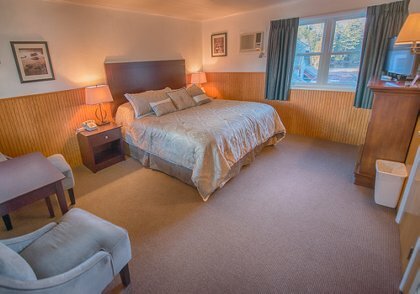 Adirondack ambiance surrounds you in our comfortably appointed rooms, kitchenettes, suites and cottages. 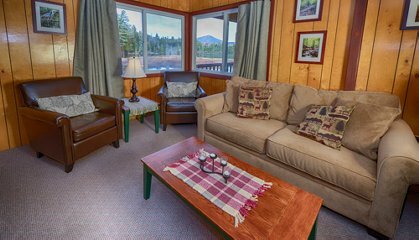 Make your reservations now for accommodations in the beautiful village of Lake Placid. 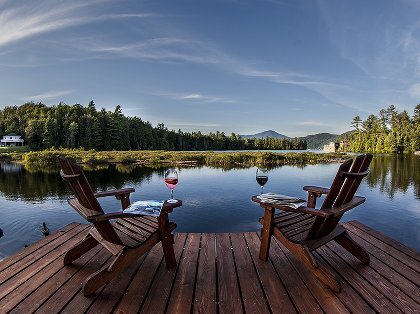 Enjoy the romance of a true Adirondack setting, where you can stroll to downtown shops, theater and restaurants. 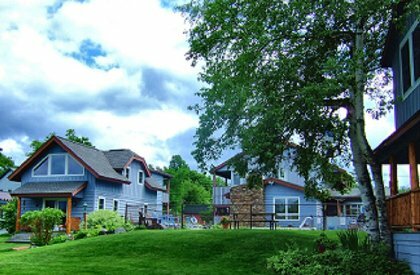 Placid Bay Inn is a glorious year-round vacation destination offering canoes, outdoor pool, picnic tables and Adirondack Chairs for your lounging comfort by the Lake. We have discounted golf and Olympic Site Tour packages, in the warmer seasons. In winter, enjoy one of our many Ski Specials or the Winter Passport, which includes ice skating, cross country skiing, Gondola ride and discounts for a bobsled ride. We also have several year-round packages: Romance, Chocolate Decadence, and Romantic Picnic Basket. 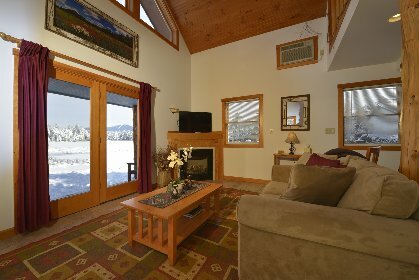 You can view all of our accommodations, including Lakeside cottages with photos, full description, and price on our web site. Just click on the link for STAY. You can BOOK ONLINE right there. 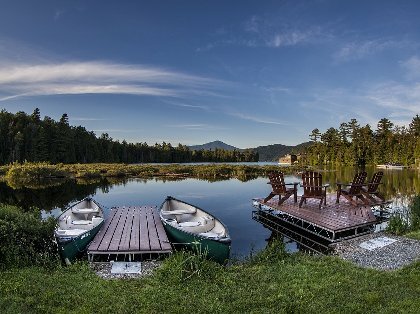 Canoes, outdoor pool, picnic tables, Adirondack chairs for lounging by the Lake with magnificent views of Whiteface Mountain and Free Wi-Fi. Packages available: Romance, golf, downhill skiing, free X-C skiing, Chocolate Decadence, Roses, Romantic Picnic Basket and Summer/Winter Olympic Passport. We offer a FREE Placid Bay App that gives you a plethora of information and discount coupons! We offer special discounted package for cross-country skiing, downhill ski, golf and numerous romance packages. Download the Free Placid Bay App from Google play store or iTunes. It is full of great things to see & do, with coupons! Enjoy paddling on Lake Placid in one of our canoes. 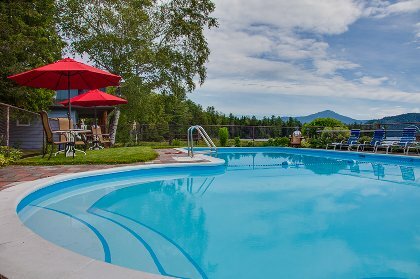 Our seasonal pool has beautiful views of Lake Placid and Whiteface Mountain, and our gardens. Enjoy the gardens and lakefront living. 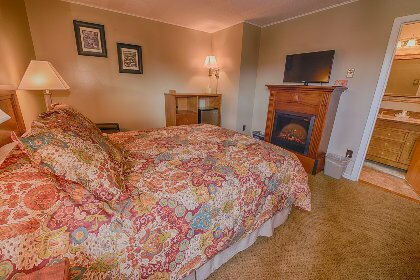 Our 3 bedroom Country Comfort Cottage offers the most privacy, tucked closest to the lake with a large covered porch to relax and enjoy the view. We have numerous lounging chairs by the Lake to enjoy a relaxing morning or evening. With Whiteface and Lake Placid in our backyard, every view is an amazing view! View of the Inn and cottages looking from the lake. 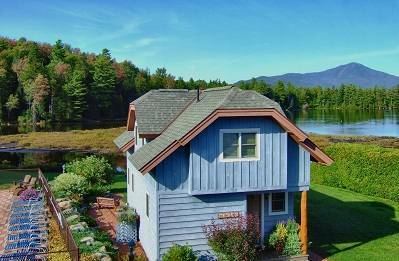 We stayed in Mallard Cottage overlooking Lake Placid & all I can say is, I'd love to go back! Although it was October and very cold, we had heating and a fireplace. Cozy comfortable lounge, great kitchen & bathroom. The cottage was spotlessly clean, the bedding clean and new. I suppose the highlight was the view , wow!! Mallard ducks, the lake, Whiteface Mountain, truly a room with a view!! Each morning we awoke to a bit more snow, as a South Africa, this was truly exciting as we just don't see snow much!! Denise, the owner, was so helpful and hospitable. The cottage is amazing as we could go to the supermarket up the road and buy food to prepare at the cottage. The cottage is a short walk (15 minutes) to Mirror Lake, where one can access all the restaurants. Can't say we enjoyed the food much except Mirror Lake Inn, which was excellent! Went on some incredible hikes in the area. If i ever visit lake placid again I would definitely stay at Mallard Cottage without hesitation! Loved this hotel. The staff is very accommodating and friendly. Everything was clean and neat. Gorgeous views from the back of the hotel and the pool. It was very fun and convenient to take the canoe out on Lake Placid. You can't swim from this beach but it is very relaxing and beautiful to look at. There are great food choices that you can walk to from the hotel. Just a .5 mile from the Hannaford's food store. It is a mile to the Ironman Start line. It can get a little tiresome for spectating on race day. My husband and my boys, 15 and 18 years old, brought bikes to go back and forth. They were wiped out since it is a bit of a climb from main street to the hotel. If you had younger children, this would be tough. As an athlete who has done Lake Placid 3x, I found it very relaxing to be a little bit removed from all they hype, but still be close to the IM Expo when needed. Great staff, super clean rooms, gorgeous pool and lovely views...very convenient to everything you need...I would stay again in a heartbeat! My husband and our two adult daughters stayed in 3 bed Country Comfort Cottage which was the perfect get away after a lovely but hectic (and very hot) time in Manhattan. The view is utterly beautiful and is well represented in the photos on the website. The scene constantly changes with the mood of the weather and the lake and mountain in the distance were so peaceful and just what we needed. We used the rowing boat provided by the Inn which gave us hours of enjoyment. The toads croaking and the wildlife around made it feel like we really had got away from it all in spite of the easy access to a supermarket and other shops. There are lovely walks around the lake from the Hotel as well. The staff were friendly, the house kept spotlessly clean and if we didn't live in England we would be visiting regularly. Thank you to all at the Hotel for a surprisingly wonderful break. My husband and I just returned from Placid Bay Inn "On Lake Placid" on October 5th. We visited the area to enjoy the beautiful fall colors. We stayed in the Inn for 4 nights in a queen suite with kitchenette. The property is extremely clean with large rooms, nicely decorated, and very affordable prices which made it perfect for us. The backyard has adirandack chairs that we enjoyed in the morning and evening and we had many ducks visited from the lake. There are canoes, and paddle boats for guest to use. The hospitality and information that Denise and family offered us during our stay made us feel like part of the family. The area of Lake Placid is beautiful and we spent our time running around Mirror Lake, hiking the many local trails, taking in many breathtaking views of gorges and waterfalls, took a boat tour of Lake Placid, visiting the shopping area, and eating in the many restuarants. I would highly recommend this property and area to anyone looking for a nice relaxing vacation with many things to do in the area. We flew into Burlington, Vermont and took the ferry over to New York (1 hour ferry ride and 1 hour drive to Lake Placid. Deposit: We require half down, or one night deposit, whichever is greater. Cancellations and Refunds: There is a 14 day cancelation on rooms, kitchenettes and suites, and a 30 day cancelation for cottages. During special events this cancelation notice may be longer. Inquire during booking. Other Fees: There is a cleaning fee for cottages only.